*Packed in a plastic box. Nylon Flat washer assortment kit, packed in a plastic box, 8 sizes, total 450 pieces. Suitable for metric M2, M2.5, M3, M4, M5, M6, M8,M10 screws/bolts. All products are made of durable nylon, Strong,anticorrosive. Different Size, Require all you need. If you have any questions about this product by Guard4U, contact us by completing and submitting the form below. If you are looking for a specif part number, please include it with your message. 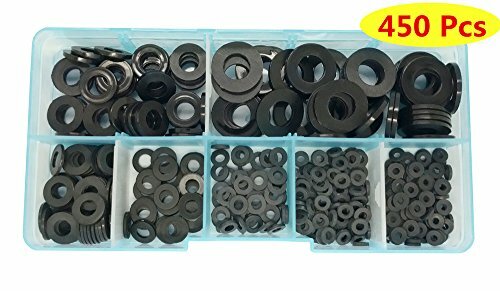 1/4" x 5/8" OD Stainless EPDM Washers, (100 pc) Neoprene Backed, Choose Size & QTY, By Bolt Dropper.